The questions are endless and they illustrate the complexities involved with food distribution, especially when you take food safety regulations, perishability, and other factors into consideration too. The frozen food portion of the order is assembled at 6:30 a.m. and loaded in the front compartment, or nose, of a multi-temperature trailer where the temperature is 20 degrees below zero. A special partition, or bulkhead, is closed to protect the product. Meat and cheese are loaded next and “sealed” at their proper temperature in the second phase. Produce and flowers are loaded in the final phase. [Craig McGuirk, distribution manager of The Kroger Co.’s Kentucky Distribution Center] explained that the multi-temperature truck keeps costs down by allowing one truck to be used for various products, cutting down the number of trucks needed to deliver an order. But what if that multi-temperature trailer (MTT) is used to visit multiple stores, or in the case of food distributors, multiple clients? Many of these MTTs have a single unloading/loading door at the back of the trailer, which means, for example, that if you’re delivering ambient, refrigerated, and frozen products to multiple stores or clients, the first store or client has to unload all of the products in the first temperature zone to reach the next temperature zone. In such a scenario, what is the optimal way to load these trailers and route the deliveries? Routing just a handful of trucks to a few stores or customers in the most optimal manner — that is, in a way that minimizes miles driven and costs while satisfying delivery time windows and other customer constraints — quickly reaches the limit of human capability. When you consider that large grocery retailers and distributors have hundreds or thousands of trucks, along with thousands of pickup and delivery locations, the route optimization problem becomes, well, truly mind-boggling! Good luck trying to solve this problem using a spreadsheet if you have a large distribution network, especially when you add other factors and constraints into the mix, such as delivery frequency and trailer capacity (e.g., maximum cube or number of pallets) per temperature zone. There are two critical variables in our model that together define the various options available to RetailCo while delivering to small format stores: 1) type of trailer: whether single temperature or [multi-temperature trailer] and 2) number of stops: whether single or multiple. In order to structure our analysis, we have organized these options into a matrix, where one axis is type of trailer and the other is the number of stops. 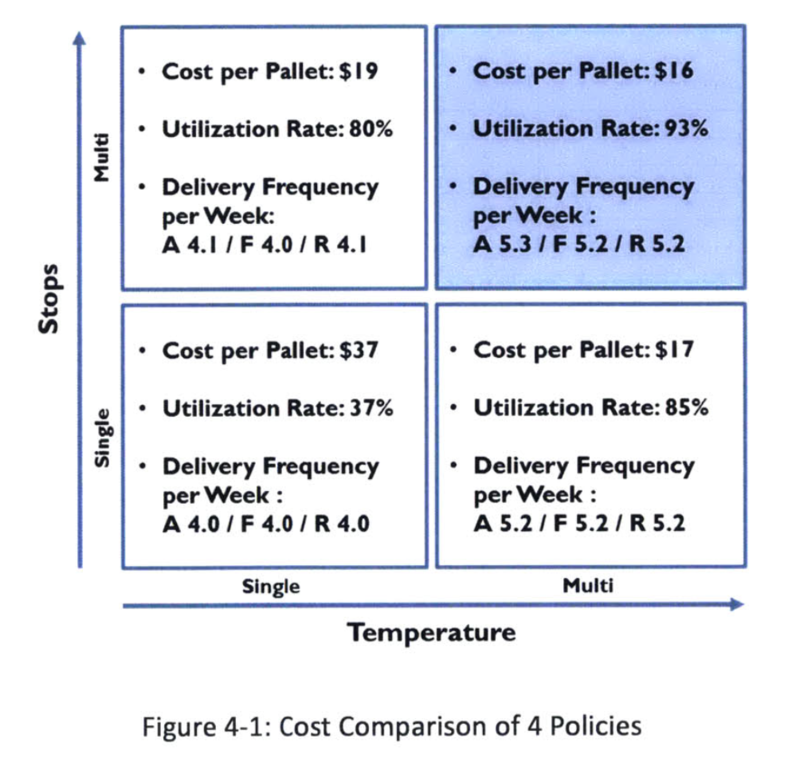 The first part of our overall analysis focuses on assessing the four different policies in this matrix by utilizing historical sales and delivery data and determining which policy is most cost-effective. The second part of our analysis is the usage of optimization modeling and simulations on the selected scenarios for further examining feasibility and developing a generic framework for delivery to small format stores. This case underscores an important point: the more complex supply chains become, the more important optimization becomes, and this is especially true in food distribution, where profit margins are thin and losing customers due to poor service or quality is costly. “We need the ability to make smarter decisions faster,” is what supply chain executives tell me. They might not realize it, but what they’re really saying is that they need optimization. The good news is that today’s optimization solutions are not only much more powerful than in the past, they’re also much more user friendly and configurable. The latter point is particularly important because no two distribution operations are the same, and operating realities and constraints are continuously changing too, so optimization solutions must have the ability to take into account all of the unique requirements and constraints of each operation, and make it easy for users to make adjustments as changes occur. So, the next time you walk the aisles of your favorite supermarket, stop for a moment and think about all of the complexity involved in getting those cereal boxes on the shelf, deli meats in the refrigerator, bananas on the produce stand, and ice cream in the freezer.